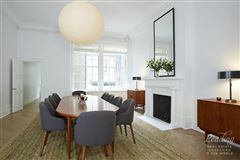 Located on a tree-lined Street off of Park Avenue, this magnificent 20-foot wide elevatored townhouse has a Neo-Federal brick and limestone facade and encompasses approximately 8,200 square feet plus a 1,730 square foot basement. The gracious layout with grand proportions has beautifully scaled rooms and includes seven bedrooms and 6.5 baths. 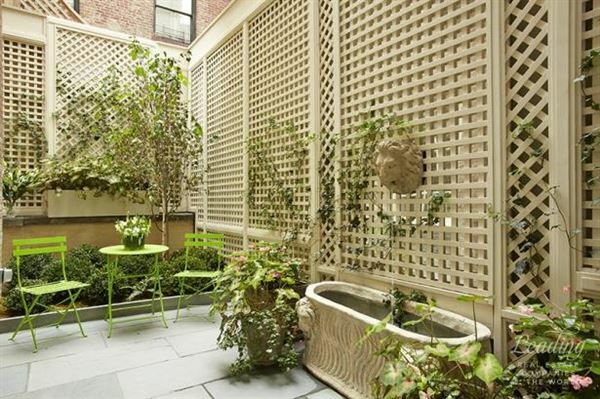 Outdoor space consists of a charming garden and two terraces. 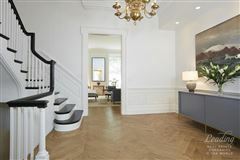 The current owners worked closely with world-renowned curatorial developer, Adam Gordon on every aspect of the renovation and design of the home, restoring its original grandeur while meticulously updating the entire residence with the finest finishes and appointments throughout. Resplendent with glorious natural light, this stunning residence features pristine White Oak hardwood flooring in a Chevron pattern, soaring ceilings, classic plaster moldings, wood baseboards, wainscoting, original picture-frame moldings, ceiling medallions, tall doorways, recessed panel wood doors, and five working fireplaces. There are also new landmarks-approved custom mahogany double-hung windows throughout. There is a 5-zone central-air-conditioning system, a state-of-the-art security system with video display phones throughout, a new Siedle entry intercom system and an industrial Wifi system. 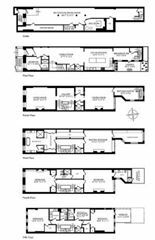 The first level includes a foyer leading to a vast 27-foot gallery with a coat closet and a marble powder room. 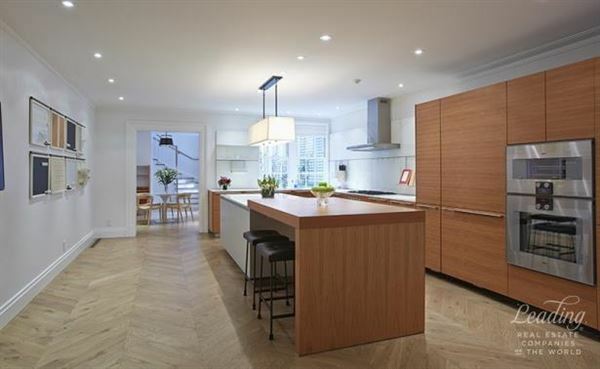 The new Bulthaup kitchen has been outfitted with appliances from Miele, Gaggenau, and Sub-Zero and has cherry and aluminum cabinets and white Glassos countertops. There is also a large windowed breakfast room which overlooks a delightful 26-foot landscaped garden with automatic irrigation, custom-built lattice surround and bluestone paving. A sunny guest room with a full marble bath is also located on this level. A stately staircase leads to the upper floors of the home and there is also an Otis elevator, which goes to all five levels. 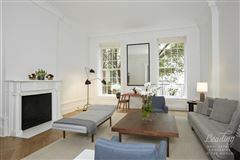 With a 12'5 ceiling, the impressive Parlor level includes a grand 25-foot living room with a fireplace with a hand-carved mantelpiece, two tall brand-new double-hung windows facing South, and restored original plaster moldings. 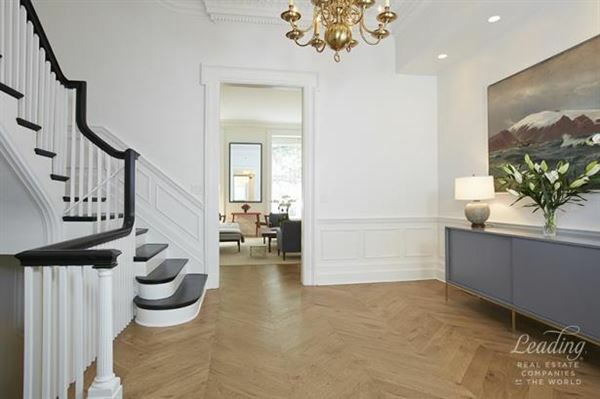 On the other side of the gracious staircase landing, there is elegant 23-foot formal dining room featuring a fireplace, two large new double-hung windows and a generous windowed butler's pantry. A sumptuous master suite may be found on the third level of the home. It includes a 22-foot master bedroom with a fireplace, two sprawling dressing rooms with custom millwork and built-ins, a vast walk-in closet and separate controls for heat and AC. The luxuriously-appointed master bathroom features white Dolomitti marble throughout and has two custom vanities, a new MTI 6-foot soaking tub, an oversized shower and Dornbracht fittings. The fourth level includes two 22-foot bedrooms, each with a marble full bath en suite, a fireplace and ample closets. 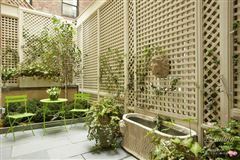 A lovely terrace may also be found on this level. 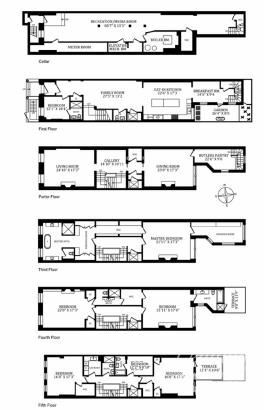 The fifth level has three bedrooms, two full baths and a 130 square foot terrace. There is also a full laundry room on this level. 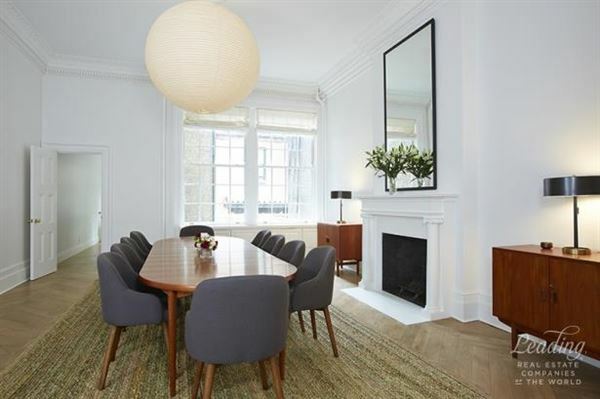 The home's immaculate basement has a ceiling height of 8'5 is ready to be converted to a media room, play room, home gym, home office or could also be used as a wine cellar. There are separate mechanical rooms which house a new Weil McLain boiler as well as a commercial gas hot water heater with an electrical back up water heater. There is 400 Amp electrical service and an industrial strength dehumidifier. This house was originally custom built in 1906 for G.L. 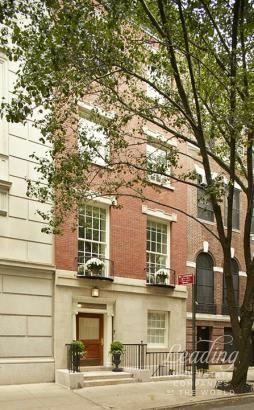 and Charlotte Frelinghuysen by the architects Pickering &Walker (who also designed several distinguished Park Avenue buildings). The Frelinghuysen's replaced a circa-1869 house that was originally part of a row of thirteen houses, numbers 105 through 125 East 65th street, and lived there until 1944.